Theatre snacks are sorted! 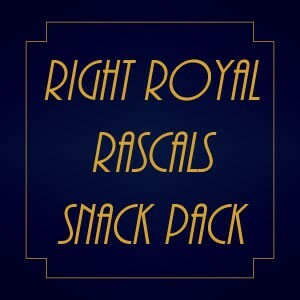 Pre-purchase your Right Royal Rascals’ snack packs and we’ll have them waiting for you at the theatre when you arrive! The Right Royal Rascals’ snack pack includes a delicious cookie, a tasty fruit bar, savoury crisps and your choice of drink from the options in the option tab below. Bookings are available to add to your order until 48 hours before the show. Please note a 3% credit card charge applies. What’s in your snack pack? All packed up in a Right Royal Rascals’ snack box. Already bought your tickets? Book your Royal Rascal Snack Pack. The Right Royal Rascals’ snack pack includes a delicious cookie, a tasty fruit bar, savoury crisps and your choice of drink from the options below. Snack Pack 1 with Mini Pump Water. Snack Pack 2 with Charlie’s Orange Juice pouch. Snack Pack 3 with Charlie’s Blackcurrant & Apple Juice pouch.